We develop all our programs with one thought in mind. Will this improve the health of our members, their families, their communities? Whether members are at the beginning of their lives, needing prenatal or early dental care. At the challenging stage where behavioral health, housing or care coordination support are key. Or near the end, when homebound, palliative or hospice care can bring comfort and security. We are here to make health care work for all. 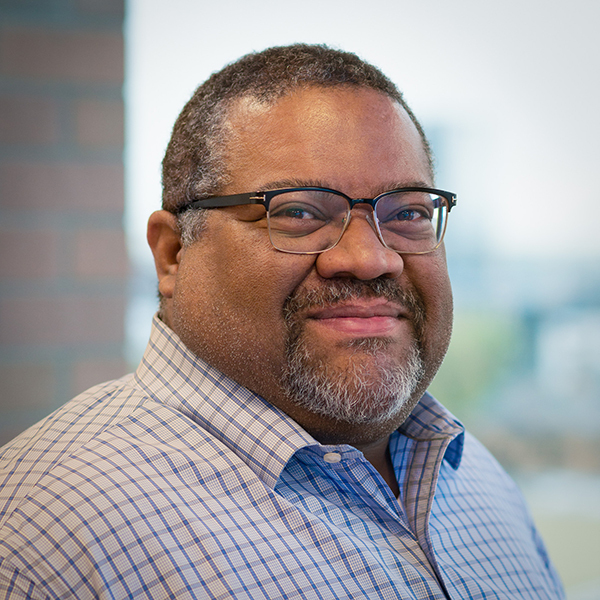 President & Chief Executive Officer Eric C. Hunter works collaboratively with members, providers, staff, legislators and community partners to improve health equity and address the social determinants of health. At CareOregon, our goal is to improve the lives of the people we serve. Every day, we strive to build stronger communities by making health care work for everyone. Health is made up of many factors, not just physical wellness. To live a healthy and happy life, you need stable housing, nutritious food, exercise, and an emotional and psychological support system—all in addition to great health care. CareOregon’s family touches each of these. We serve as a catalyst for collaboration across our communities. Partnerships, integration, alternative payment models, grants and training all combine to help strengthen the delivery and community systems that support member health. We celebrate diversity, inclusion and hope through unique member programs and staff engagement. And through creative problem solving, we search out ways to get member voices heard, ensure provider needs are met and make the community healthier. This work brings us closer, day by day, to those we have the honor to serve. Members, providers, community partners and CareOregon staff come together in countless ways to make health care work for everyone. Founded in 1994 as a safety net for the recently formed Oregon Health Plan, CareOregon has been a nonprofit providing health plan services, education and community support for 24 years. During that time, we’ve added to the family to meet our members’ changing needs. While serving the largest number of Medicaid members in Oregon, we added Medicare—CareOregon Advantage—in 2006. 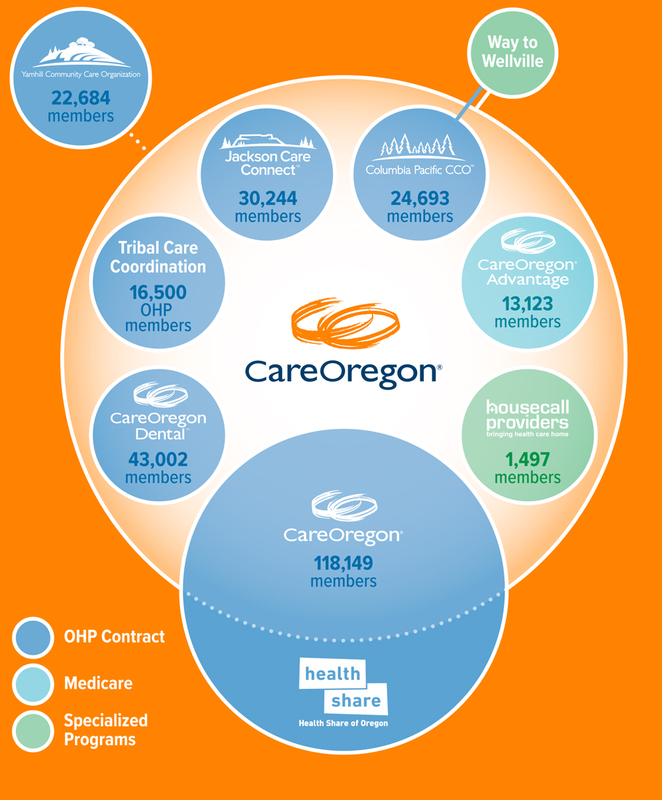 In 2012, we helped form and support Coordinated Care Organizations (CCOs) and added CareOregon Dental. In 2017, we added in Housecall Providers and collaborated with the state’s Nine Federally Recognized Tribes and the Oregon Health Authority to form Tribal Care Coordination. And throughout that time, we supported community needs with additional organizations focusing on population health. Today, we are making strides in integrating physical, dental and behavioral health care and treating substance use disorder. The CareOregon family is working with our members, their providers and communities. We are committed to improving and protecting the health of all Oregonians, with a focus not just on health care, but on total health and well-being. To ensure our ability to meet the needs of our members and their families, in both good times and in lean, CareOregon has carefully maintained a prudent level of reserves over the years. In 2017 we experienced a significant rise in the acuity of our membership, as well as medical cost trends exceeding the rate of increase in Medicaid and Medicare funding. Yet CareOregon remains a source of stability amid this turbulent landscape. We will continue to improve the cost effectiveness and quality of health care and to tightly manage administrative costs, enabling CareOregon to strengthen the communities we serve in 2018 and beyond. Over the past two years, CareOregon has invested more than $20 million in Oregon communities through grants, sponsorships, improvements in provider capacity and social services. By investing in programs such as preventive care, access to healthy food and stable housing, safe neighborhoods and more, we are helping to improve health outcomes for our members and create healthy environments for all Oregonians. And by empowering people to get healthy and stay healthy, our Community Investments are reducing health care costs now and in the years to come.